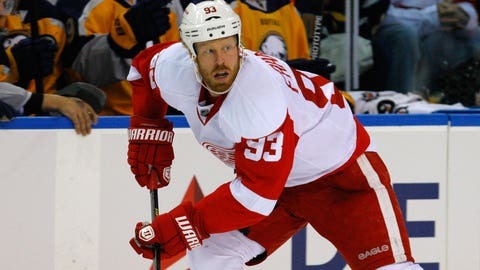 Johan Franzen will not be able to represent Team Sweden because of a concussion. DETROIT — A concussion has knocked Johan Franzen out of the Olympics. Franzen will not be able to represent Team Sweden because of a concussion he originally suffered on a hit from Tampa Bay defenseman Radko Gudas on Dec. 15. After the hit, Franzen missed 16 games, then returned last Sunday at home against the Florida Panthers. But his headaches and nausea returned, so the Wings placed him on short-term injured reserve Tuesday. "It’s doubtful we’ll play him before the Olympic break," Wings general manager Ken Holland said. "Hopefully he’ll be ready to go after the Olympics." 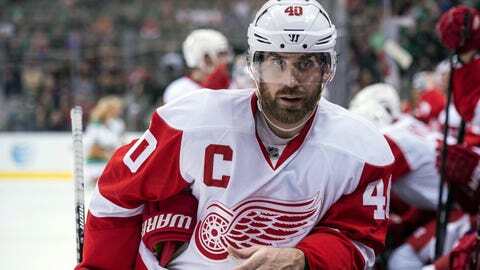 DETROIT -- There's a good chance the Red Wings will get their captain back for Friday's game. Holland said they do not need to place Franzen on long-term injured reserve, which requires at least a 10-game absence, because they could do so after the Olympic break and back-date it. The Wings will still have nine players in the Olympics, including five others on Team Sweden, including captain Henrik Zetterberg, Jonas Gustavsson, Daniel Alfredsson, Niklas Kronwall and Jonathan Ericsson. Pavel Datsyuk, who remains out with a lower-body injury, is the captain of Team Russia. Jimmy Howard is a member of Team USA while Tomas Tatar and Tomas Jurco will play for Team Slovakia. Wings coach Mike Babcock will coach Team Canada. There is a possibility that Franzen’s replacement could come from the Wings as Gustav Nyquist is one of three players on Team Sweden’s reserve list. The others are Washingon’s Marcus Johansson and Nashville’s Patric Hornqvist. Holland also said that Stephen Weiss, who is expected to return from core muscle surgery after the Olympic break, will travel with the team to Florida to continue practicing. Weiss skated with the Wings Thursday.